Qype Business of the Year! Sh! received the best birthday pressie EVER last night when she scooped 2 awards at the first ever Qype business awards, including the TOP one: Best Business of the Year, UK & Ireland 2012. After a wee drink and a munch on a curry goat roti on the Ibizan-style roof terrace ( in London – in MARCH! ), it was down to the main room for the ceremony. Dark and glitzy, with wine,cupcakesand party poppers on the tables, the CEO of Qype, Ian Brotherston, took to the stage to tell us we were all winners, having demonstratedexcellent customer engagement and been given fab reviews, as rated by Qype’s ( which stands for quality over hype)1.6m consumers across the UK. A wee cheer went up as our name was called out and Kathryn stumbled ( there were a lot of wire and stage stuff to negotiate; the wine had nothing to do with it) to receive the prize. A *huge* cheer, this time. More stumbling ( again, *not* the wine, but the sheer wobbly-legged excitement)… Another award gratefully received- the BIG one! Being Business of the Year means Sh! will now go on to represent the UK at the Qype World Business of the Year Awards, which will see one business named the best of the 13.5 million places currently listed on Qype worldwide – Yikes! Then, back upstairs to the sunsetting terrace, for photos, mingling and lots of congratulations. Later as we buzzed back east, in our pink smartie and on cloud 9, we talked about why such a great accolade from a consumer review site means such a lot to us. We’ve always looked at our business as a series of relationships we have with every one of our customers. If someone isn’t happy, we take it personally, emotionally even, – like a relationship breakdown and do our danmdest to make up. We’ve never seen it as a numbers game, where we can accept a certain % of fallout, so long as we get money in the till. Running a biz with this kind of personal attention may never make us millionaires ( we’re in a smartcar FFS not a porche!) but it sure makes us happy … and we sleep well at night. We certainly slept with happy smiles on our faces last night. Thank you to Qype, and most of all to our lovely customers, for recognising our passion is personal and very much in the detail. Founded in 2006, Qype is Europe’s largest site for user-generated reviews and recommendations of places, events and experiences. Qype has up to 18 million unique users per month and over 2.2 million user-generatedreviews covering business categories in more than 166,000 cities with locations worldwide. Qype allows users to search for and read trusted reviews about a restaurant, shop, service or experience and, with the Qype App, which has been downloaded over 1 million times, users can read and add reviews on their phone and use the application as a personal sat-nav to find places nearby. Available in seven different languages, Qype is now the only truly pan-European local review site able to offer its international users a multi-lingual platform. Sh! Wins Best LBQ Business Award at Planet London Awards. Sh! 20 Year Anniversary Party at Café de Paris Sh! 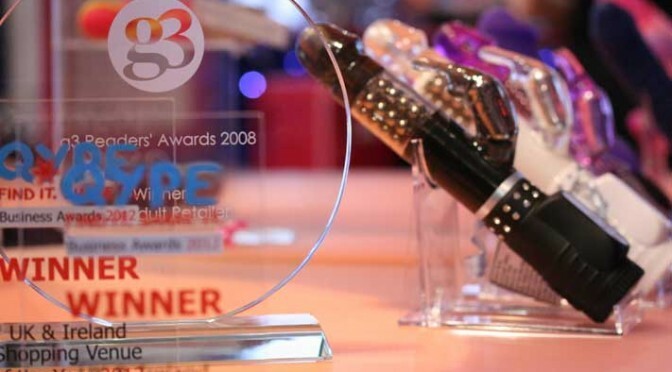 named ‘Most Innovative Retailer’ at ETO Awards 2012 Festival must-haves to pack this year Sh! Voted Best Individual Store 2016! ETO Awards: Sh! Crowned Most Innovative Retailer 2013 Sh! 21st Birthday Love London 2018 Awards: Vote for Sh! Previous PostSh! Turns 20Next PostSuite Moments at Sh!